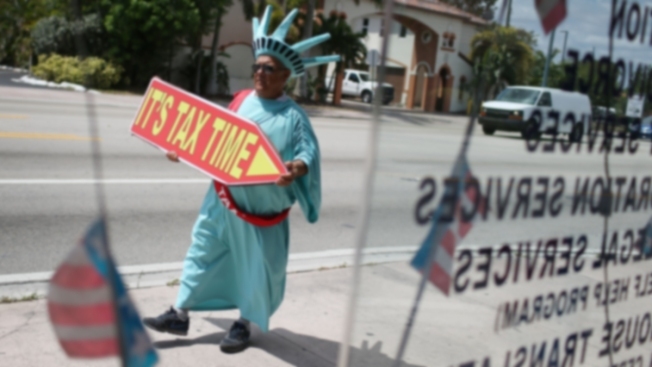 In this April 15, 2016, file photo, Armando La Rosa directs people to the Liberty Tax Service office as the deadline to file taxes loomed in Miami. With Tax Day around the corner, more people are able to answer the question: Will I get a refund or do I owe? The big takeaway: You could be surprised at how the new Tax Cuts and Jobs Act affects your bottom line. ln fact, almost one-third of taxpayers who must pay up to the IRS this year received a refund last year, a new survey from personal finance website NerdWallet found. One in 5 individuals owe additional money to cover their tax bill this year, the survey found. And 32 percent of those people received a refund last year. NerdWallet estimates that 7.9 million people who received refunds last year could owe this year. Those who do have to pay $2,119 on average. But there is good news for people who are getting refunds: They may be higher than you expected. The average refund is $2,697, NerdWallet found. That’s significantly higher than the $1,861 on average that individuals said they expected to get back in a separate poll in December. About 60 percent of individuals who have prepared or filed their taxes will get a refund this year, according to NerdWallet. Those who stand to get the biggest refund: millennials, who will get back $3,013 on average. In contrast, Gen Xers can expect to receive $2,944 and baby boomers should see $1,943. One more reason to cheer: The government shutdown apparently has had no lingering effects on how quickly returns are being processed. Of the individuals who have filed their returns, 41 percent received their money in two weeks or less. That should dissuade people from taking out so-called tax refund anticipation loans, which can come with unfavorable rates, according to Andrea Coombes, tax specialist at NerdWallet. “If you just stick with the normal process and wait for your refund from the IRS, you’re likely to get it pretty quickly,” Coombes said. Those who had the longest wait for their checks: parents of children under 18. That is because the IRS did not start processing refunds for those who claimed the earned income tax credit or additional child tax credit until Feb. 27. While the tax law changes are prompting individuals to approach their taxes differently, there is one area where they are falling short. Just 17 percent of those surveyed said they plan to revisit their tax withholdings after this year’s return. That also applies if you’re getting a refund this year. That sum could instead be coming to you over the course of the year. A $3,000 refund, for example, could add up to $250 more per month in your bank account, according to NerdWallet’s calculations, after you adjust your withholdings. “It’s fun to get a refund,” Coombes said. “A lot of people like that windfall. NerdWallet’s online survey was conducted by The Harris Poll between Feb. 27 and March 1. It included 2,031 individuals ages 18 and up.